Patrick Watson is prepared to take you through those places in the back of his head, where he will introduce you to all of those people that wander through our minds. His most recent record, Adventures in Your Own Backyard, is a delightful dose of nostalgia, and a wonderful journey full of colour and character. I won’t go into much detail about this album, mostly because I feel it will mean completely different things depending on who is listening. Everyone should take a little trip through their backyard, whatever it may be, and Patrick Watson will guide you all along the way. You may dig up some beauty that you left buried for a very long time. I had the chance to see Patrick Watson perform at the Montreal Jazz Festival last year, a show that included his own 5-piece band, a brass quartet, two string quartets, and a full choir. It was beautiful, it was powerful, it was moving, and you couldn’t help but leave the building with a feeling that Patrick Watson played for each and every individual in the room. I expected Watson to be a quiet and very introspective man on stage, and so I was pleasantly surprised to find that he is a bit of a goof who giggles frequently and seems to really love the fact that other people are enjoying something he created. There were more than a few brain-melding jams to pull me to all kinds of different places. I really recommend seeing this band if you have the chance. I’ll leave you with a little taste of the vast variety of soundscapes brought on by the music of Patrick Watson. This is a cut down acoustic version of what can be found on Adventures in Your Own Backyard, brought to us by NPR’s series called the Tiny Desk Concerts, which include acoustic performances from many of my favorite bands. 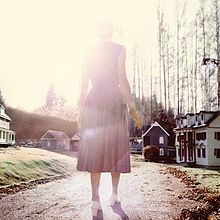 On one final note, Patrick Watson’s second album, Close to Paradise is absolutely brilliant. Check it out.